If you can get over the minutes long transformations usually found in Mecha and Mahou Shoujo, the story itself is o.k. for a B-grade series. I was almost ready to bump it to a 4.5 star, but then I thought about the cute brown girl who has kept me watching, but she has a squirrel. Thinking back on those old GFs with their road-dogs snuggling between us in bed with their stinky fur subtracted the half star. I really enjoyed this. Nothing was overboard and all that I like to see in a Mecha more than 12 episodes long was there. I'm a huge fan of Eureka 7 and macross frontier, so I really liked the other-worldly elements that linked into the use of the Mechas as well as the bonds of friendship that form and transform as the story progresses. The characters were all very unique and it made watching them interact and overcome obstacles very enjoyable. I'd like to see more like this or even more of this one for sure! As casual anime - it is indeed watchable and enjoyable. As Mecha anime, well, 2/5. As Evangelion spiritual follower -> it strongly 'smells' like made by someone, who thought she got the concept of the original. It is like "oh, I have seen a bus, I guess I can build my own now, I don't need to graduate from engineering uni, nope, not at all..". In such case 1/5. I still gave it 3/5, as hard-core Evangelion fans are now a very thin base of active anime watchers, and casual anime fan can totally enjoy this anime. Even an mecha fan can, as the only part this anime lacks, is the psychological one. Not that it does not try, but it miserably fails. And that was quite entertaining for me. I just hope, this is not the new standard of 'serious, non-comedy-like' anime. Its so booring its scary.Its so booring its scary.Its so booring its scary.Its so booring its scary.Its so booring its scary.Its so booring its scary.Its so booring its scary.Its so booring its scary.Its so booring its scary.Its so booring its scary.Its so booring its scary.Its so booring its scary.Its so booring its scary.Its so booring its scary.Its so booring its scary.Its so booring its scary.Its so booring its scary.Its so booring its scary.Its so booring its scary.Its so booring its scary.Its so booring its scary.Its so booring its scary.Its so booring its scary.Its so booring its scary.Its so booring its scary.Its so booring its scary.Its so booring its scary.Its so booring its scary.Its so booring its scary.Its so booring its scary.Its so booring its scary.Its so booring its scary.Its so booring its scary.Its so booring its scary.Its so booring its scary.Its so booring its scary.Its so booring its scary.Its so booring its scary.Its so booring its scary.Its so booring its scary.Its so booring its scary.Its so booring its scary.Its so booring its scary.Its so booring its scary.Its so booring its scary.Its so booring its scary.Its so booring its scary.Its so booring its scary.Its so booring its scary.Its so booring its scary.Its so booring its scary. Draggy. Ending is unclear. Why did I like it this much? Daichi has some character. Akari has more. I liked that Daichi and Hanna form an overt love relationship in the middle; not waiting to the end (or never). The ending changed many things but didn't answer them (Kiltgang have no ego blocks: mortal, trapped on Earth, and starting to want to just be human) (now that the threat to Earth is gone, what will the Ark Faction do?) (Daichi & Hanna: alive but not alive? Can they interact with Earth as ghosts?) Actually things are set up to make a more interesting additional season. Which isn't happening. Teppei could have had an interesting back-story, but it wasn't shown. So many things that could have been developed but weren't. We wasted sooo much time watching the mech transform sequence way too many times. Since that time could've been better spent on plot, it's obvious they just wanted to save money. Great story through to the end. Satisfies the craving for actions and adventure while still delivering in the character development we all need to create a character bond. The story will keep you engaged at every turn without appearing out of this world. Something crucial for me is a good plot that ends in a happy ending. BONES did it WRONG AGAIN!! What's with BONES and having Yoji Enokido write!? So Captain Earth is a story about a kid on Summer vacation reuniting with a childhood friend who's an alien. Discovers that they both have infinite access to this super energy they can use to power into their robots. Captain Earth is a mecha anime that suffers from its bad writer. The enemies are weird aliens that are "disguised" as humans. The aliens gather new allies who are humans who apparently have their alien brethren inside them if that makes any sense. Despite they have an entire episode dedicated to the enemy's soon to be allies, more than half are instantly forgotten and hang out in the background with maybe one or two lines despite so much characterization they were given. There is too much fan service in the most inappropriate times and they were done poorly. Even more poorly than animes that is nothing but fan service. You know what they call this super energy I mentioned earlier? It's called LIBIDO. Unfortunately, Enokido seems to not understand the meaning of the word. There is only one time do they actually mention the real definition of the word and that was very late in the story. "It was I, the guy you did not expect to be the final boss all along!" But it ended with a "love conquers all!!!" kind of ending. The battles were okay, sometimes a hit or miss. Final battle was epic, but that scenes I mentioned earlier ruined it. What ticked me off most about this mecha anime was the third party. When you see a third party, you'd expect they would be on no ones' side and attack both of them. They are called Salty Dog, which you will find out soon. And I must get this off my chest. Salty Dog is one of the DUMBEST AND MOST ANNOYING THIRD PARTIES in any anime ever! It's a government organization that was supposed to protect Earth, but constantly attacks the protagonists, WHO ARE PROTECTING EARTH ALSO, and throws everything they have to kill them. Not once do they actually fight the antagonists! And the government demanded multiple times to STOP TRYING TO KILL THE HEROES and help the protagonists, which they only do in spite and later disobey. What's their motive for doing all of this you ask? THEY WILL NOT HAVE A BUNCH OF CHILDREN SAVING THE WORLD! DESPITE THE FACT THEY'RE THE ONLY ONES WHO WIELD THE POWER TO FIGHT THE ALIENS! 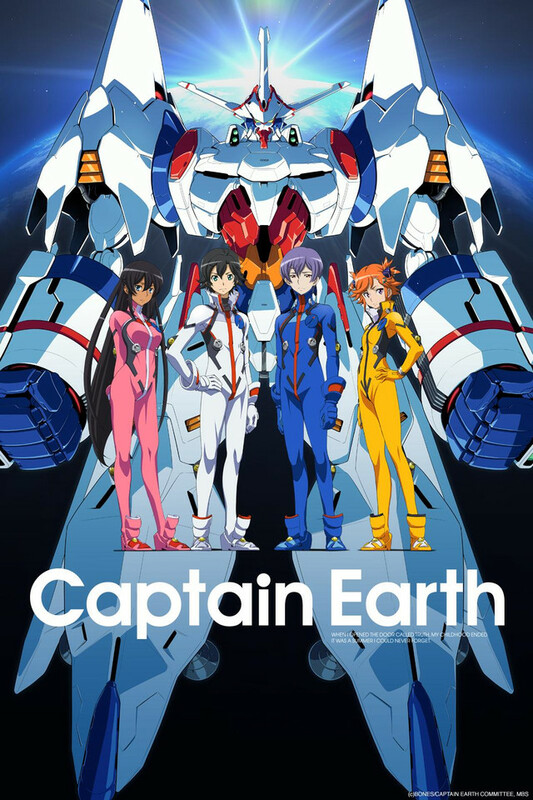 Overall, Captain Earth is another mecha anime with wasted potential. Written by the man who wrote Star Driver ruined it too with its "I beat the bad guy! THE END." ZERO CLOSURE. Then BONES made a fake sequel movie that was a compilation movie in disguise. Screw Captain Earth and I hope BONES fires Enokido for his terrible writing. its boring, its slow, again very little action. imagine batman before he became the dark knight, has the money but instead of having responsibility's he pays the police to do the crime fighting for him even though he has a job, one to put a end to crime that killed hes parents, this anime does just that. a kid is giving a insane fortune via war suit that can be used in battle, a alien gun and 3 larger bases in space that assemble the robot. as you can see on the poster it heavily rips off evangelion's body suits which dont server a purpose other then to look serious when they are NOT. the girls dont need them. only our main character has a reason too. so who are our villains? what do the go by? the goodfellows or something really stupid. land mechs are introduced but are called mm buses? what? one female that was used by the enemy somehow warps from earth to space? The story starts well with mystery and emotional connections between characters. The arts are also elegant. These good things, although still existing in several episodes afterwards, are not maintained well. In later episodes, it is still not difficult to see interesting emotional stories of various characters, and many are not only interesting but also touching. However, many episodes become the "enemy of the week" types of fillers. They can be viewed as good individual anecdotes but contribute little to the overall plot. When the fillers are going on, more settings are introduced without enough explanation for the audience to understand them. This continues until this anime end, where the final scenes are rushed. Many things that are fundamental to the story and plot are still left unexplained and not even implied. It would be better if the not-so-good episodes are compressed a little to leave the final scenes more time to refine.